Been a while since I updated. Sorry about that. I was on the go for the better part of a month starting on December 18, spending the holiday season with my parents in Maryland, and a week with my grandparents in the Virgin Islands. It was a good way to cap off 2012, and as I mentioned in my last post, 2013's already off to a good start. At the beginning of December I wrote an article for the Cecil Whig about the hazards of holiday season travel, specifically the time I ended up stranded in the lobby of Heathrow for four days. The article ran the day I got home. There's nothing like coming home for the first time in a year and seeing yourself in the paper. Perpetual Motion Machine, the publisher who recently bought one of my stories for an upcoming tribute to Kurt Vonnegut, recently announced plans for another tribute, this time for Charles Bukowski. There was a story that had been knocking around my head for a few months that I thought would fit the theme, and this seemed liked the perfect excuse to get it down. Since anything worth doing is worth doing right, I decided to employ some Bukowsian methods. I picked up some cheap wine on the way home from work on a Saturday afternoon. When I got home I poured the first glass, turned on the classical music, and started typing. Seven hours later, the wine was gone and the rough draft was done. I'm very happy with the end result. It's short, direct, and dirty. 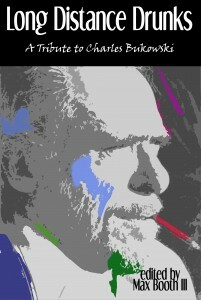 In true Bukowski fashion it's semi-autobiographical, and tells a story of which I'm not exactly proud. Unfortunately I probably won't know until this time next year if it'll make the cut for the anthology. In the meantime, if you have any unpublished tales of booze and madness (or you feel like writing one), send it their way!